Cut wonton wrappers into strips. Shred taro coarsely using a grater. Divide shredded taro into two. Color one portion with red food coloring and the other with green food coloring. Keep them separate. Heat about 1 inch depth vegetable oil in a fry pan. Deep fry dumpling wrappers until golden brown, about 30 seconds to 1 minute. Remove with a metal strainer. Deep fry colored taro strips separately until crispy, about 2 to 3 minutes. Remove with metal strainer. Store in air tight containers until ready to be used. Shred jicama, daikon, and carrots into fine long strips. Keep shredded vegetables separate. Do not mix. Place smoked salmon in a small bowl. Then place the bowl in the middle of a large platter. 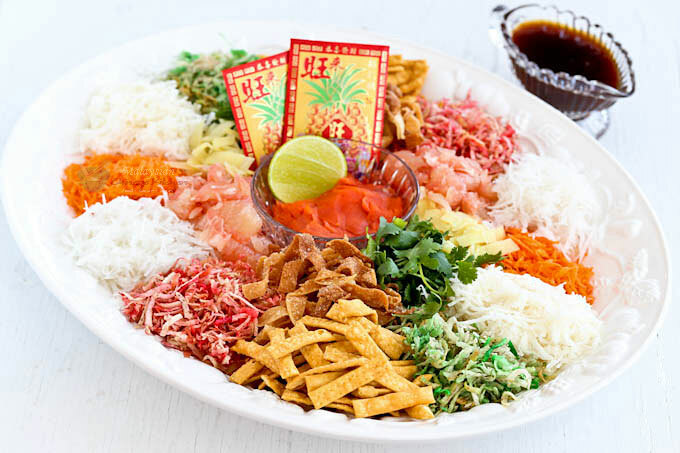 Arrange crispy dumpling strips, taro, shredded vegetables, cilantro, pomelo, and pickled ginger into individual sections on the large platter. When everyone is gathered around the table, squeeze lime onto smoked salmon. Then, transfer the smoked salmon onto the vegetables. Sprinkle five spiced powder and sesame seeds and drizzle dressing over vegetables. Get everyone to toss the salad using chopsticks.